Everyone's favorite Web-Head is back and better than ever with Marvel HeroClix: The Amazing Spider-Man! Web-swing into action with more than 45 figures to collect among Spidey's friends and foes, including The Daughters of the Dragon, Vulture, Kaine, and Hobgoblin, as well as thematic Chase figures and all-new Prime figures! Prominent sub-themes showcase Spider-Man's Rogue's Gallery, magic-wielding mystics of the Marvel Universe, and Marvel Horror! Plus, "Wild Dials" unleash monstrous new abilities - feed Dracula's thirst and sate his Vampire Hunger, go on a Full-Moon rampage with Werewolf By Night, or create illusory duplicates with Mysterio! 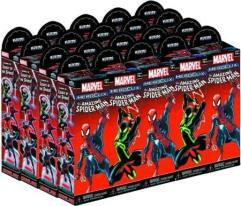 Each factory-sealed case contains 20 Amazing Spider-Man booster packs.